The Ottawa police and Crime Stoppers is seeking the publics help in identifying a male suspect in mail theft. On the 26April2018 at 1640hrs a Amazon parcel was stolen from the front porch of a residence on Creston Valley Way. 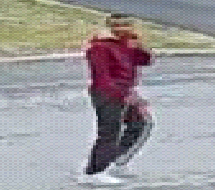 The black male suspect is described as having a skinny build, late teens or early 20’s and wearing a red hoodie, grey sweatpants and white shoes. If you know the identity of the individual call Crime Stoppers toll-free at 1-800-222-8477 (TIPS) should you know the identity of the . Remember Crime Stoppers does not subscribe to call display, we will not ask your name or record your call and you are not required to testify in court. If your information leads to their identity, you could qualify for a cash reward of up to $2000. You can follow us on Facebook, YouTube and Twitter.